Abductive reasoning takes place in forming "hypotheses" in order to explain "facts." Thus, the concept of abduction promises an understanding of creativity in science and learning. It raises, however, also a lot of problems. Some of them will be discussed in this paper: After analyzing the difference between induction and abduction (1), I shall discuss Peirce's claim that there is a "logic" of abduction (2). The thesis is that this claim can be understood, if we make a clear distinction between inferential elements and perceptive elements of abductive reasoning. 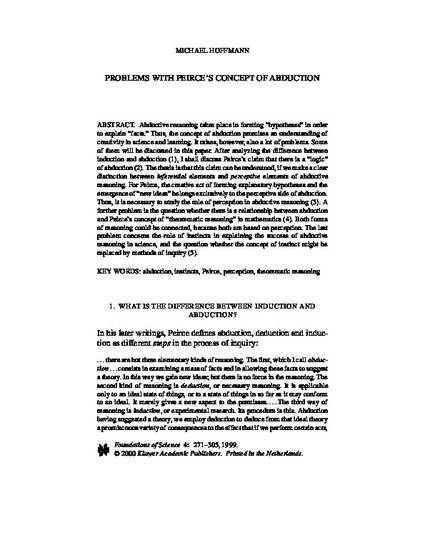 For Peirce, the creative act of forming explanatory hypotheses and the emergence of "new ideas" belongs exclusively to the perceptive side of abduction. Thus, it is necessary to study the role of perception in abductive reasoning (3). A further problem is the question whether there is a relationship between abduction and Peirce's concept of "theorematic reasoning" in mathematics (4). Both forms of reasoning could be connected, because both are based on perception. The last problem concerns the role of instincts in explaining the success of abductive reasoning in science, and the question whether the concept of instinct might be replaced by methods of inquiry (5).